I'm a white-label partner with a new customer. How do I create a new account? As a white-label partner, you have the ability to create new accounts. First thing you do is to login to the super admin. 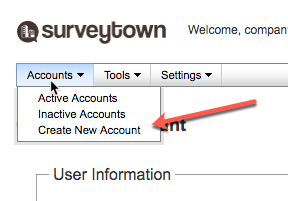 After that you then click on "Accounts > Create New Account"
This is bring up the dialog that lets you put in all the information about your new account. Application Skin - You skin is created when we create your white-label partner account. Billing Phone - If you customer goes to "Settings > Billing" they will be shown this phone number in order to contact you for questions about upgrading their account. Billing Redirect URL - If you customer goes to "Settings > Billing" they will be shown this URL in order to contact you for questions about upgrading their account. Hide Webhooks in Client UI - You can limit your customers ability to create their own webhooks by checking this box. If you do that then you would use the "Webhooks Setup" settings below to set the Webhooks yourself. Hide Password Reset - You can limit your customers ability to change their own passwords by checking this box. You can setup your customer's Webhooks here. This is especially useful if you have hidden your customer's ability to change this themselves.